Microlens arrays can be found in different applications, such as imaging, wavefront sensing, and so on. With the physical-optics simulation technique in VirtualLab, the working principle of the microlens array, e.g. in the case of wavefront sensing, can be clearly demonstrated, and the performance of such systems can be evaluated efficiently. It is also worth mentioning that the diffraction effect from the edge of the individual microlenses can be taken into consideration in the simulation. The imaging properties of a microlens array with different lens shapes are investigated. Change of the focal spots with respect to aberration of input field is demonstrated. 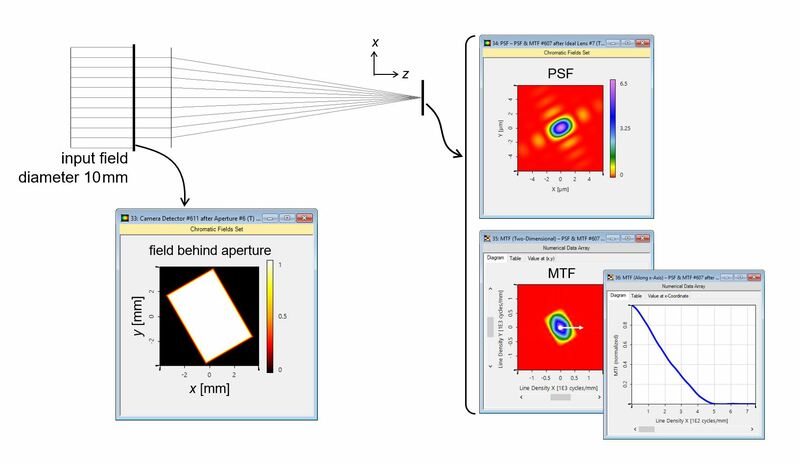 Newsletter/News Modeling, Microlens Array, Diffraction, Apertures Microlens arrays can be found in different applications, such as imaging, wavefront sensing, and so on. With the physical-optics simulation technique in VirtualLab, the working principle of the microlens array, e.g. in the case of wavefront sensing, can be clearly demonstrated, and the performance of such systems can be evaluated efficiently. And, it is worth mentioning that the diffraction effect from the edge of microlenses can be taken into consideration in the simulation.